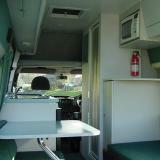 The Ford Transit 2 Berth Motorhome includes Shower and Toilet. Equipped with either 2 Single Beds or a King Size Bed. 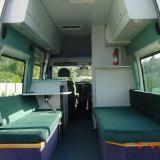 This is the vehicle for those who want the extra space in the 2 berth range. 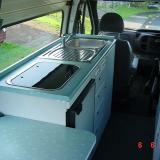 Ford Transit 2 berth with Shower & Toilet. 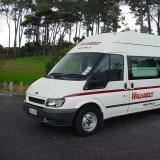 Powered by a 2.4 Intercooled turbo diesel engine, equipped with a CD Stereo, Dual Airbags, Microwave, all living equipment these are easy to drive and a very responsive campervan. All charges are calculated on a daily basis, not a twenty four hour day. A compulsory insurance charge of NZ$20.00 per day covers your hire vehicle for windscreen breakage and third party property and public liability insurance The hirer is liable to pay a bond which is compulsory in the event of an accident or damage done to the vehicle. PLEASE NOTE you are advised to arrange your own insurance to cover your own personal possessions (not covered in this insurance). All hirers are subject to a bond, ranging from NZ$2000 including GST is payable which is payable at the commencement of the hire and can be paid by cash or imprinted signed credit card. The bond is FULLY REFUNDABLE providing the vehicle has not been in an accident or damaged in any way and is clean and tidy, waste tanks emptied and the fuel tank is full upon return. No refunds can be given for any unused portion of your holiday.